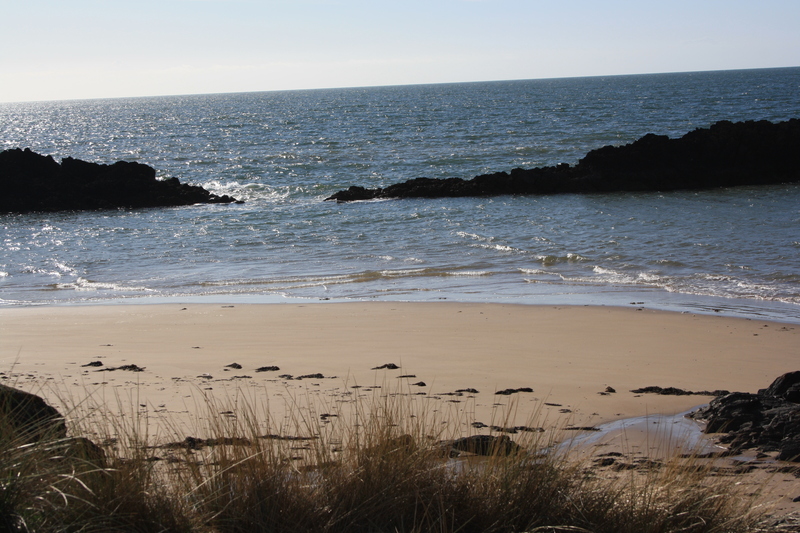 Llanddwyn Island lies on the south west corner of Anglesey, close to the village of Newborough. 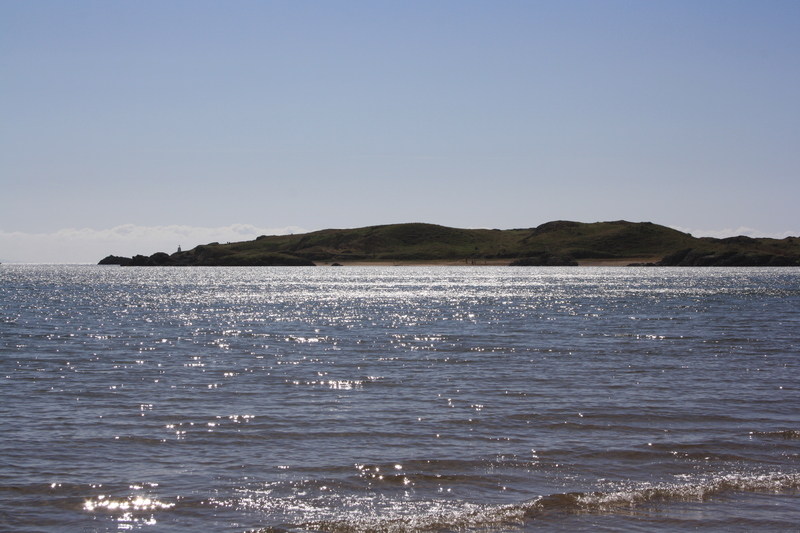 Although in the past it was an island, it is now so only at the highest tides, It was at one time connected to the mainland by a stione built causeway, today it is possible to walk across a sand bar that has gradually formed to link it to Newborough beach. In summer months there is a constant stream of visitors to the island which seems to be leading to ever increasing measures to create paths and fences to direct walkers, and reduce erosion. 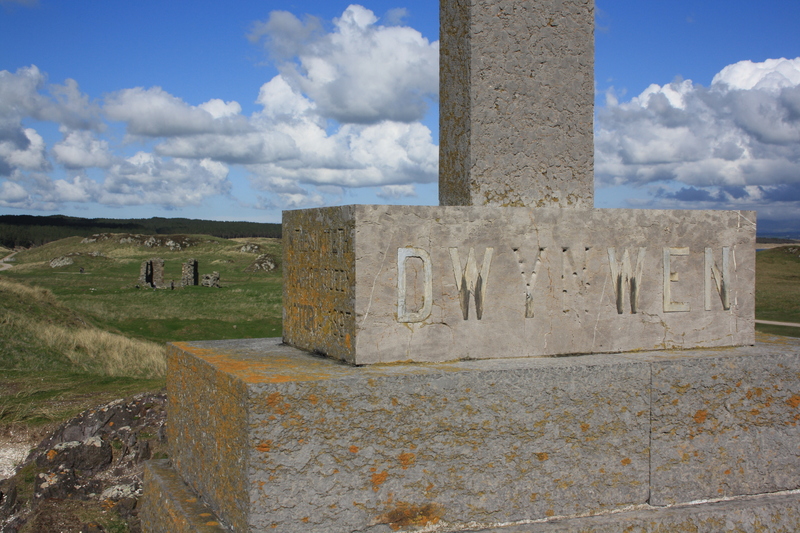 The island is the site of a church established by St Dwyn, more commonly known as Dwynwen (holy or blessed Dwyn). She was a sister to Ceinwen, commemorated nearby at Cerrigceinwen and Llangeinwen; and one of twenty four daughters of Brychan, king in Brecon. Her first church here was supposedly founded in the late fifth century.. St Dwynwen’s church was already virtually ruined by the seventeenth century, however small portions still remain, along with the traces of the monastery buildings. It is said that hoping to cash in on the benefits of the shrine a a Benedictine monastery was established on the island in the Middle Ages. No visible evidence of the monastery remains, and it is generally considered now that it never actually existed. The church was largely abandoned following the reformation and local residents removed and re-used wood, stone and lead from the building. The community that grew up around the church dispersed, and some houses were lost to the sea. In the late eighteenth up until the early twentieth centuries, the island was inhabited again, as beacons were built and pilots housed to guide ships into St Georges Channel. The rocks off shore had historically been the cause of numerous wrecks on a then busy shipping route. At present the beacon, lighthouse and old lifeboat station remain, although unused. The pilot’s cottages have been converted into a small museum which reflects the life of Dwynwen and recreates that of the more recent inhabitants of the island. Traditionally lovers would visit her well or shrine to divine the identity of future partners or to test whether existing love would last. According to accounts of her life, Dwynwen was loved by Maelon Dafrodill, whom she loved in return. However, he was said to have made inappropriate advances, which she rejected; and as a result he stormed off, spreading rumours and gossip to besmirch her reputation as he went. Heartbroken, Dwynwen swore that she would never love again and prayed to God to cure her of her love. God granted that in future she should never wish to be married, and also her wish that all other true hearted lovers should either obtain their desires or be cured of their passions. He also finally released Maelon at her request, whom he had temporarily frozen into a block of ice. 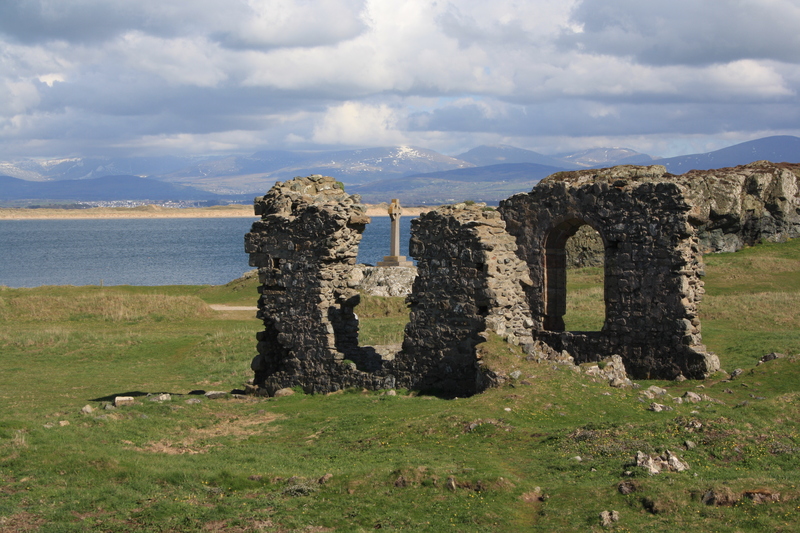 Dwynwen then took the veil and founded her church on Llanddwyn Island. Not only lovers resortedto the shrine, Dwynwen’s well also gained the reputation for curing aches, stitches and pleurisy. Her church also developed a reputation for the cure of farmer’s beasts. The following story is widely reported. Around the year 1650 the ploughing oxen at Bodeon took fright when at work, ran over a steep cliff and perished in the sea. This occurred on St Mark’s Day and the farmer concluded that it was due punishment for working on the saint’s feast day. To prevent future accidents he decreed that this day should henceforward be kept as a holiday and that two wax candles should be burned on that day in the porch of Dwynwen’s church. This practice was maintained well into the eighteenth century, the owner of the farm and other local farmers paying to maintain the church porch for this purpose at a time when the remainder of the church was in ruins. 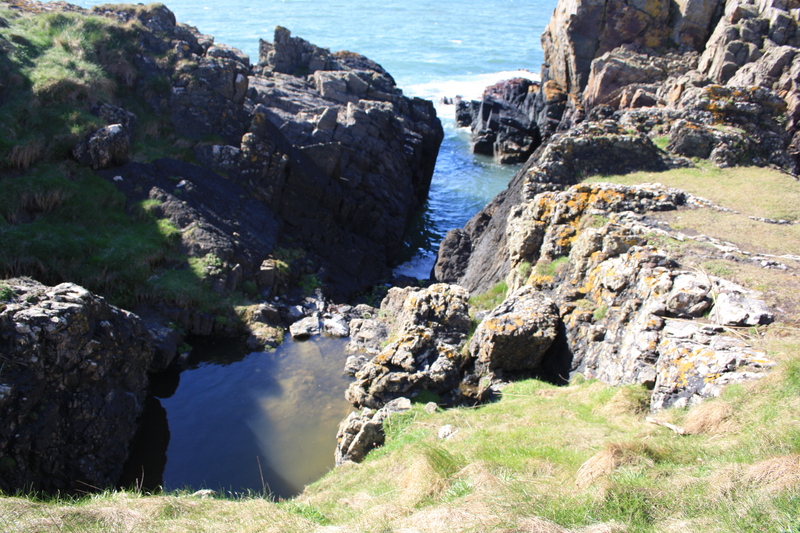 There are three wells of note in the immediate area, Crochan Llanddwyn on the mainland and,on the island itself, are found both Dwynwen’s own well and also Ffynnon y Sais. The pool is not currently clear, rather it was choked with pond weed on our visit and no eels were to be seen. Dwynwen’s Well is considered a little problematical. 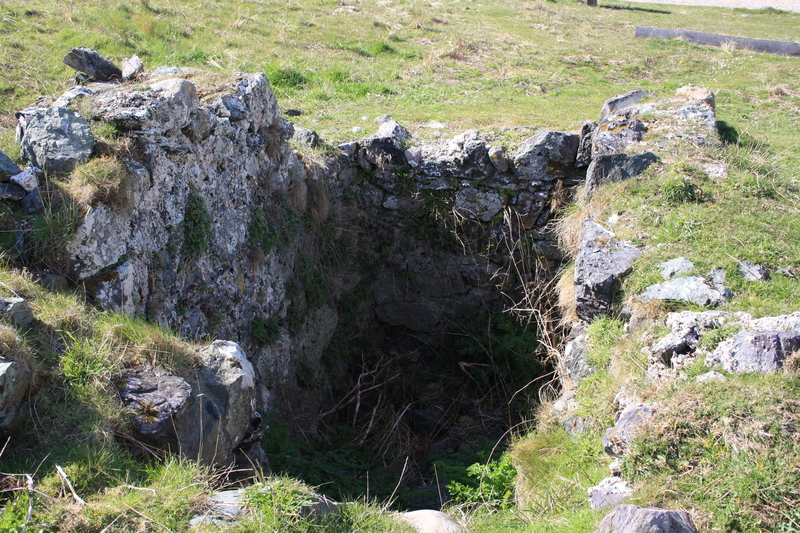 There are records of a well dedicated to St Dwynwen, also often called Ffynnon Fair (St Mary’s Well) on the island although its precise location has been open to dispute. 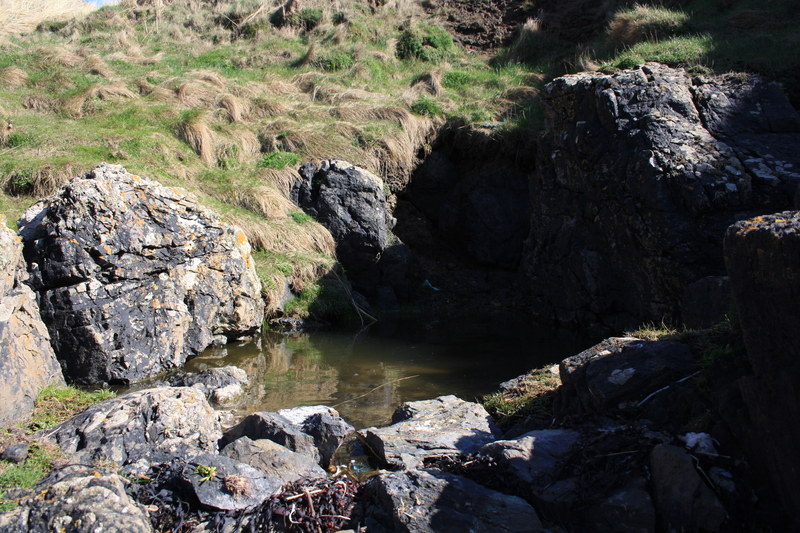 Although Dwynwen’s well was certainly resorted to for its curative powers there also remains some confusion over whether the lovers’ ceremonies were performed at Crochan Llanddwyn as described above or at St Dwynwen’s Well on the island, though i believe the former to be the correct location. Some sources state that the well on the island it is now lost. There is a well on the island clearly marked on most maps as Ffynnon Dafaden (wart well). It has been recorded that at some period in history this well was resorted to for the cure of warts, and numbers of corks with pins stuck into them, a part of the wart cure ritual, were to be found in the well. It is more than probable that this well is that dedicated to St Dwynwen. It lies high on a cliff above the sea on the north side of the island, little more than about 50 yards from the church. 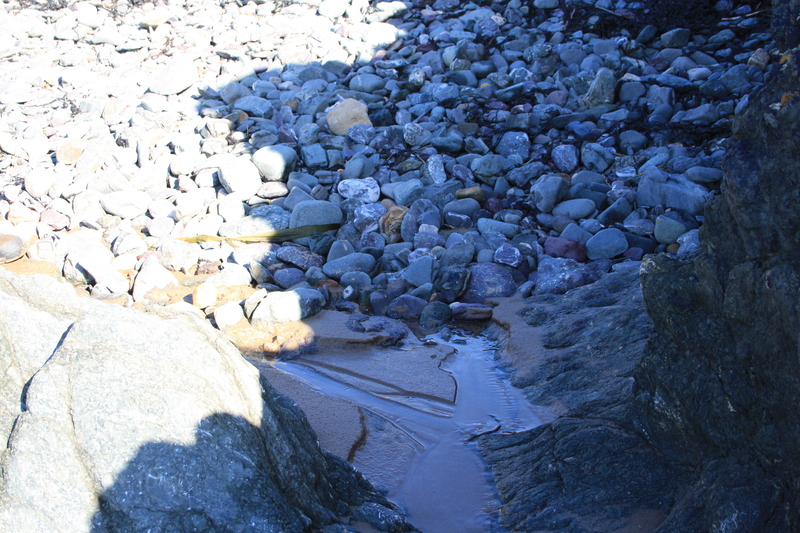 The water cascades from the well over the rocks into the sea. On our most recent visit the pool was swarming with little tadpoles. Dwynwen, who is remembered for the maxim “There is none so loveable as the cheerful”, has been the subject of numerous celebratory songs and poems over the centuries. how to assuage the griefs of wretched men. 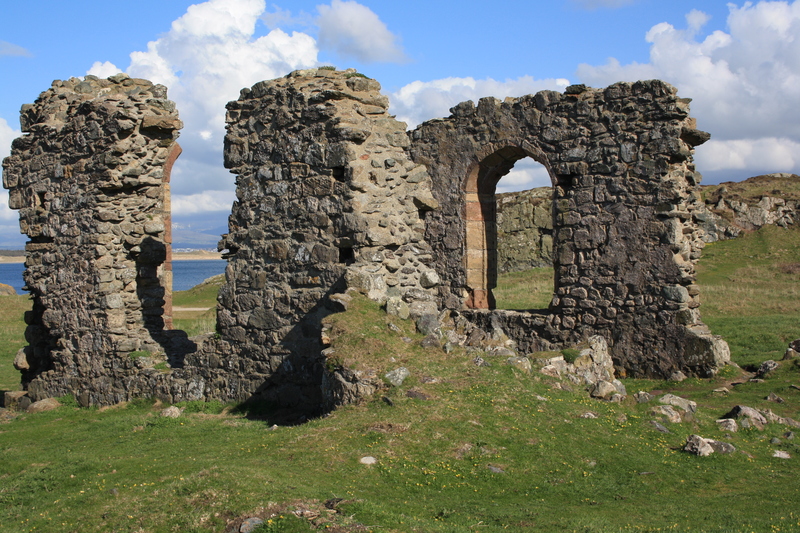 St Dwynwen’s Day is celebrated on January 25th. – for more information on the work being carried out see comment below from Tim Morgan. The project is to rebuild the east window and to clear the interior of the church but not to excavate down to the original floor. The porch continued in use after the demise of the church, the outer doorway blocked up and an altar-like stand built from reused red sandstone. CCW have permission to strip turf and topsoil and some of the wind-blown sand from the churchyard, which was reduced in size in the early 19th.century by the enclosing of fields to the east, thus redefining its shape. The finds are Post-Medieval. Funded by Cadw’s heritage and Tourism scheme through Menter Mon. 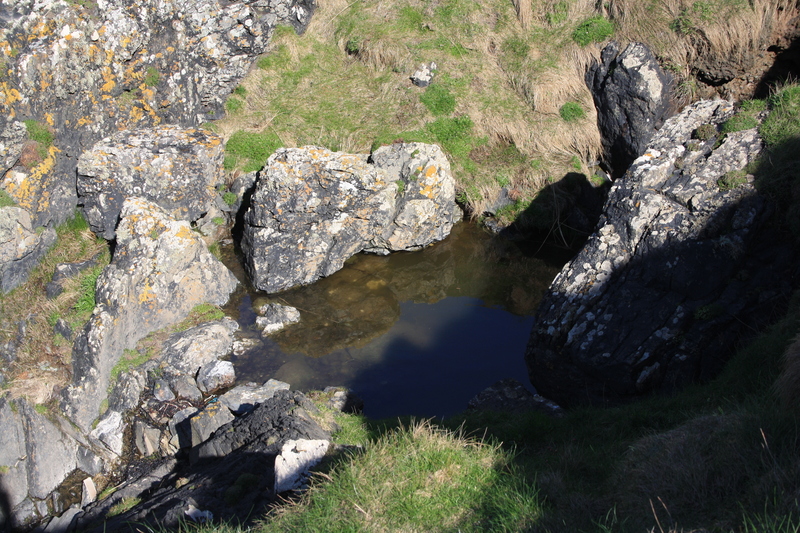 I had no idea until now that the trickle of water my kids insist we stop at on every visit to Llanddwyn, was in fact a spring! They love trying to make a dam to stop it reaching the sea. Very informative and I think I have just found my new interest for the new year! True, it’s hardly the most exciting spring – though if you’re trying to dam it then I suspect that it may be more exciting than some of the others – but a spring it is none the less. This is Ffynnon y Sais, the English spring, though how it gets that name I have no idea.